With Tax Day approaching, the Republican Tax Cuts and Jobs Act (TCJA), which included large cuts to both individual and corporate income taxes, remains front and center in the national debate. Republicans in Congress chose to make the corporate tax changes permanent, while phasing out most tax changes to the individual tax code by 2027. They made this choice to comply with the arcane rules of budget reconciliation, which do not allow legislation that increases budget deficits outside the 10-year budget window. The decision to use the reconciliation process was driven by the fact that reconciliation requires only a majority vote, thus making their proposed tax cuts filibuster-proof in the Senate. Now, having made the choice to prioritize corporate tax cuts which overwhelmingly benefit the rich, and also having made the choice to eschew any pretense of corralling bipartisan support for that tax bill and ram it through on a party-line vote, House Republicans want a mulligan. They are now calling for another bill that would make the individual tax cuts in the TCJA permanent. This one would require a filibuster-proof majority in the Senate, but they’re hoping that they can spin the individual cuts in the TCJA as “middle-class” tax cuts that some Democrats will support. This spin is false. Using data from the Tax Policy Center, we can compare the distribution of the individual income tax cuts from the TCJA to the distribution of overall income in the U.S. economy. If the distribution of tax cuts is more skewed than the distribution of income, the cuts will exacerbate income inequality. 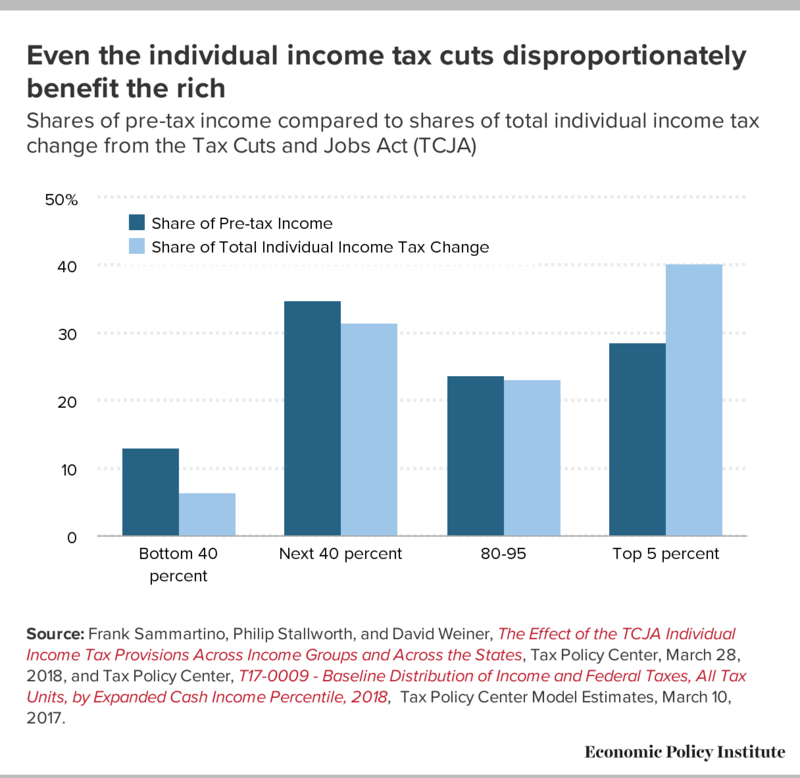 The chart below shows that, even though the bottom 40 percent—households making less than $48,600—takes home 13.1 percent of total income, their share of the tax cuts is only 6.5 percent. Households making between $48,600 and $307,900 almost (but not quite) receive as high a share of the tax cuts as their share of income. While the top 5 percent—those making over $307,900—receive a share of tax cuts substantially larger than their share of overall income. Source: Frank Sammartino, Philip Stallworth, and David Weiner, The Effect of the TCJA Individual Income Tax Provisions Across Income Groups and Across the States, Tax Policy Center, March 28, 2018, and Tax Policy Center, T17-0009 - Baseline Distribution of Income and Federal Taxes, All Tax Units, by Expanded Cash Income Percentile, 2018, Tax Policy Center Model Estimates, March 10, 2017. All told, the entire bottom 95 percent get less of a share of the tax cuts than their share of income. Only the top 5 percent get a larger share of the tax cuts than their share of income. While the top 5 percent account for 28.6 percent of income, they get 40.3 percent of the individual income tax cuts from the TCJA. This is absolutely not a “middle-class” tax cut. It’s not quite as outrageously skewed towards the top as the corporate cuts in the TCJA, a low bar to clear indeed. The priority for tax policy going forward shouldn’t be to make the regressive individual cuts in the TCJA permanent, it should instead be to roll back the even more regressive business tax cuts in that legislation. In the short run, the corporate tax cuts flow entirely to shareholders—and the top 1 percent holds 40 percent of total stocks. In the long run, between 75 and 82 percent of the benefits of corporate tax cuts typically benefit owners of capital—and the richest 1 percent of households claim roughly 54 percent of total capital income. The TCJA is already egregiously tilted towards the rich and big corporations. At best, a second pass this fall that makes its individual tax cuts permanent would just lock in further tax cuts that disproportionately skew to the rich. And even worse, it may end up a Trojan horse intended to smuggle in even more-regressive Republican priorities—like lower capital gains taxes. There’s no improving the TCJA. It should be repealed.